This set of Faber-Castell PITT Artist Pens contains six black markers of various sizes and nib profiles. 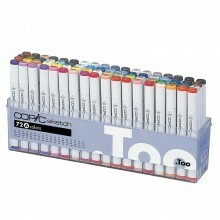 All of these markers use lightfast, pigmented artist's India Ink. The set contains a Faber-Castell PITT Artist pen in each of the four sizes (with bullet nibs from 0.1mm to 0.7mm wide), a PITT Artist Pen Calligraphy (with a chisel tip) and a Pitt Artist Pen Brush. The Faber-Castell PITT Artist Pen brush has a brush tip which is capable of drawing lines of varying width. This makes it more flexible than a normal bullet-tip marker. Large areas can be covered quickly by holding the nib at a fine angle to the paper and pressing firmly, while fine detail can be sketched if the pen is held upright and used lightly.